Talk about a betting site that means all business. It’s clear from the offset that Volt Sports is a mature betting site without the need for gimmicks. They’re putting substance before style, which might not be for everyone but for some, it will be exactly the kind of no-frills betting experience they’ve been waiting for. Your first reaction to Volt Sport is probably a pretty good indication of how much you’re going to enjoy the overall feel of this site. To some, it will seem cold and clinical and to others, it will be a breath of fresh, informative air. 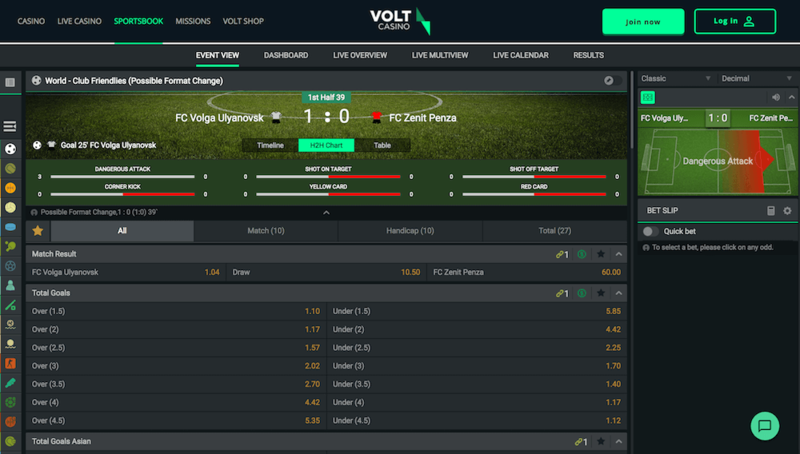 There’s no doubt about it, Volt Sport takes itself and sports betting very seriously indeed. Whether or not that’s something you enjoy about its aesthetic is down to personal taste. One thing we think everyone will agree on though is the disappointment of not having anything in the way of a sports welcome bonus (although there is one due to be launched in the not too distant future). However, perhaps it can make up for that with an all round excellent product. Unfortunately, there’s not much to say here because there are no sports promotions to be found. 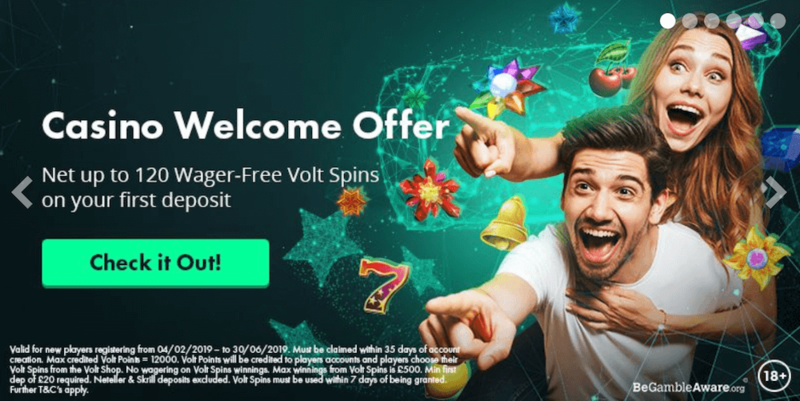 The only thing that Volt Sports currently has is a points-based rewards system, where your loyalty nets you things like free spins and even cash without the need for turnover requirements. Not only that, but this is all focused around the casino, with nothing comparable for the sports section. While this would be a perfectly acceptable promotion as part of a selection, on its own, it is simply not good enough and makes the sportsbook seem like an afterthought. Hopefully, this is all part of Volt Sport’s back to basics, no fluff philosophy, and they make up for it elsewhere. That being said, it is worth pointing out that they plan on including sports promotions soon, meaning this flaw should be taken care of in the near future. 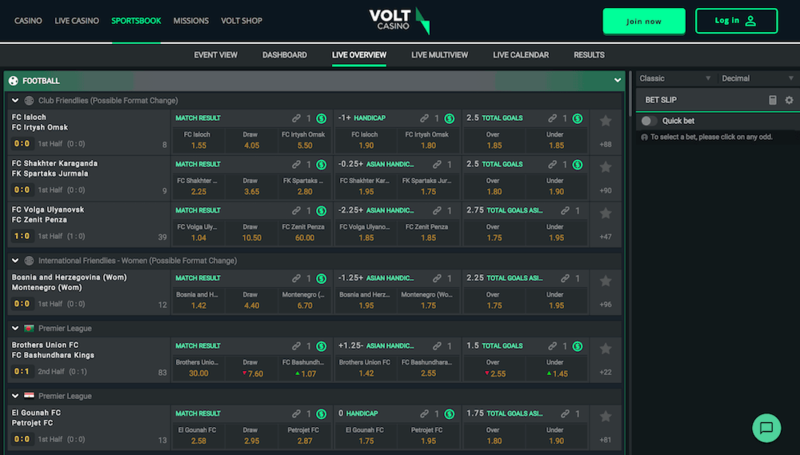 There’s much better news here as Volt Sports does appear to have a solid selection of sports betting options, with football and tennis being found alongside e-sports and lesser-known examples. In all honesty, it’s not the biggest set of options we’ve ever seen but it’s still fairly impressive. 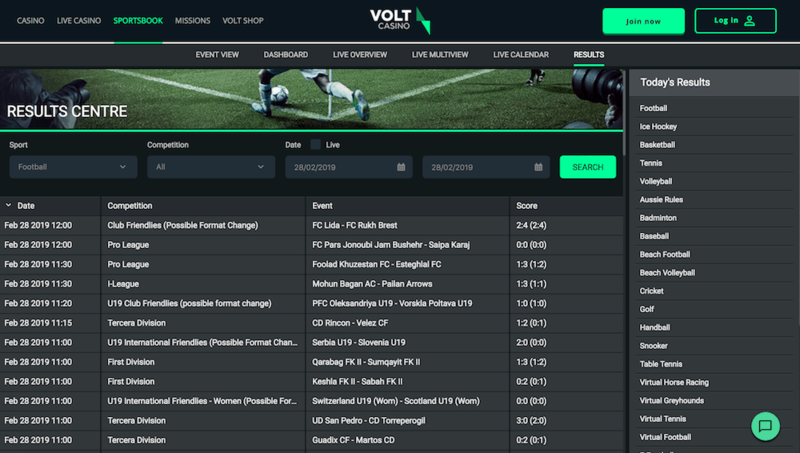 There are no examples of sports being added in here just to make the site look busier: everything has a sizeable amount of leagues and content justifying their place within Volt Sports. The only thing missing from the sports section would be virtuals, which are notable by their absence. Overall though, there’s a very impressive set of options here, and all beautifully laid out. The design of Volt Sport might not be the prettiest, but it is extremely useful and even downright impressive. That’s thanks to its ever-shifting options and helpful animations letting you track certain games from the right-hand side of the screen. The casino side of things is just as intriguing, with an astonishing selection of games from several top-level software developers like Microgaming and NetEnt, alongside a live casino. While there is no mobile app available, the website does work extremely well on smartphones and other portable devices. It worked smoothly and seamlessly on all the devices we tried it out on and there’s plenty of content to keep you entertained while on the go. Everything important seems to be included, with the casino and live casino joining the sportsbook offering here. Unfortunately, it’s a no on both live streaming and virtual sports, unless you count those animations on the side of the screen. 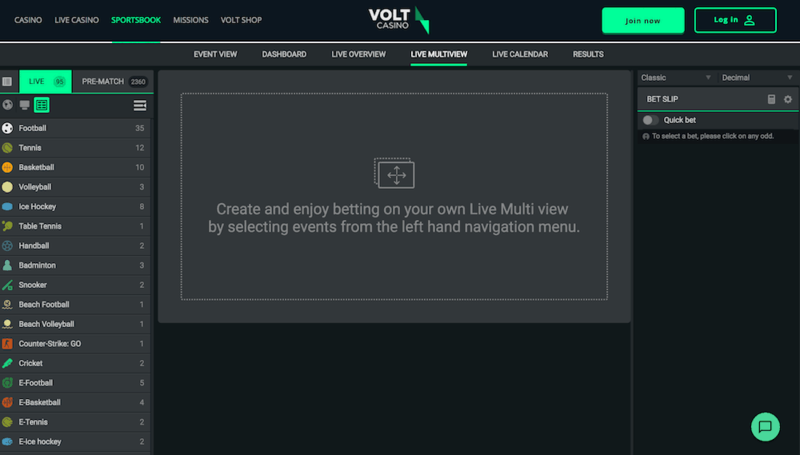 While the lack of streaming is fairly standard for all but the absolute cream of the crop when it comes to betting sites – often because of licensing issues – the lack of virtual sports is more of a letdown. We mentioned this previously, but we were surprised to see no such options considering how well the site does for content variety in most other areas. 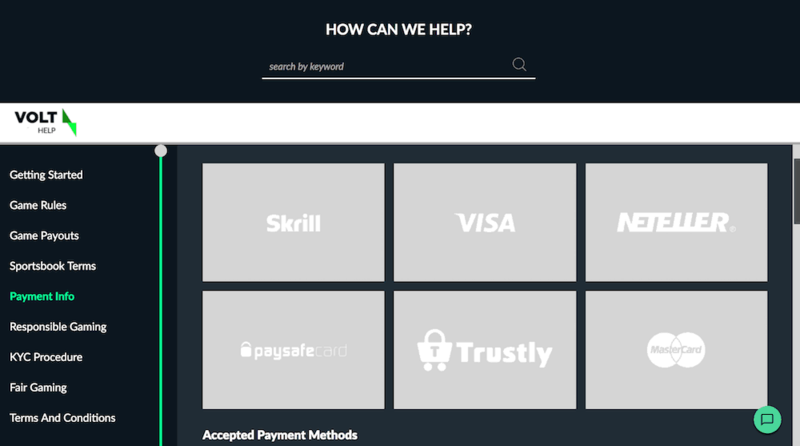 The information for payment and withdrawal methods can be found in their terms and conditions. This is not intended to cover all their terms and conditions, rather the ones we felt were the most important in our assessment of the site. So, for more information, make sure to go look for yourself. There are three options for deposit, including debit/credit cards, e-wallets and bank transfer. That doesn’t sound like much but it does cover an awful lot of ground from Skrill to Ecopayz, Mastercard and everything in between. We do have a slight criticism in that this info would be better served in an easy to follow table rather than making customers go searching through terms and conditions. However, we’ve seen far worse in terms of organisation. The minimum deposit amount is 20 euros and the maximum is 5,000 euros. Bank transfers can take between 5 and 10 days to process. The minimum for withdrawals is also 20 euros and has the same withdrawal options. Proof of identity can be requested in any case of doubt and the full identity of the player will require verification once the total amount equals 2,300 euros or equivalent. Standard ID forms apply, such as a passport, driver’s license etc. 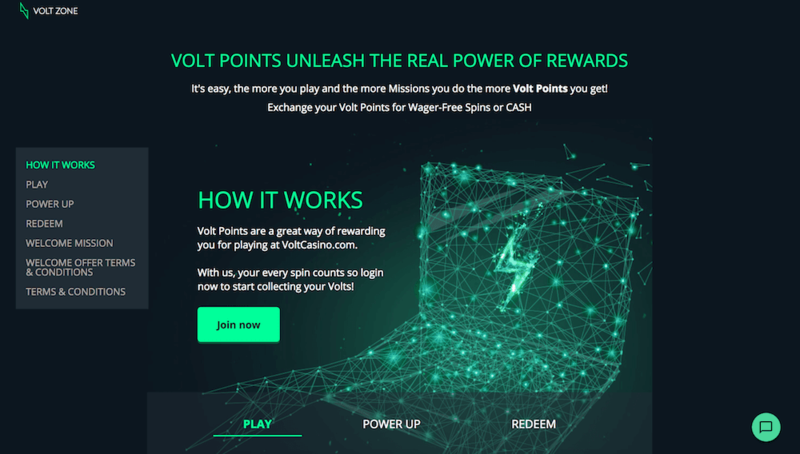 All the payment methods offered at Volt Sport seem safe and, in general, their banking options appear to be quick, easy and fairly well explained. One area in which we have to give Volt Sports a huge amount of credit is in their customer service. Every time we had a question for their live chat team, we found their responses to be fast and helpful. Our experiences couldn’t be more positive. And in our research, we’ve found few complaints regarding this part of Volt Sports. Not only that, but the service is available 24/7 and is available in several different languages. We couldn’t find other options, but we doubt you’ll be needing them. On the casino side of things, the games have also been audited to prove they ensure fair play. Finally, they also take responsible gaming seriously, with options to take a break, set your own spending limits and even have a “reality check” option to keep track of how long you have been playing. This is offered alongside advice and links to services which can help those who need it. Top marks all round here. We’ve discussed the issues with the lack of promotions earlier, however, we do have some good news: there is a casino welcome bonus. It’s about as simple as it gets though. You receive additional points and spins depending on how much you deposit, with a maximum potential win from the spin at £500. It’s a decent, if not especially imaginative way of creating a welcome bonus. But hey, at least it’s here. Whether or not you want to sign up to Volt Sports largely comes down to how much you care about virtuals and promotions. That’s because, as of right now, they are either not available here or severely lacking. If the answer is that these things are of little to no consequence to you, then Volt Sports is, in general, an excellent choice. We have pointed out that its design can appear rather cold at first glance. But we think that after you get to grips with just how easy this site is to use, and how helpful it is to have everything laid out so logically, then we doubt you’ll miss the flashier but less intuitive bettings sites out there. The amount of content is great, customer service is wonderful and, in general, the site is a very good experience. 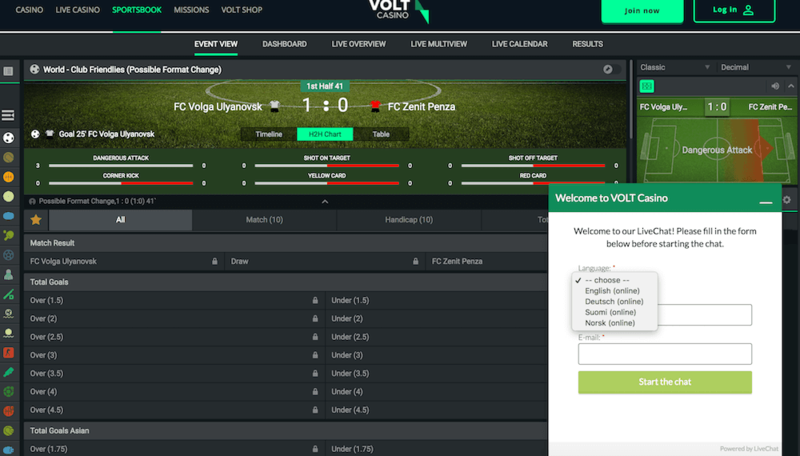 If the new promotions that are coming soon are attractive enough, then Volt Sports could well be a great betting site. As of now though, it’s just a very good one.